Ljubljana is the capital and largest city of Slovenia. The symbol of this impressive and beautiful city is the dragon. 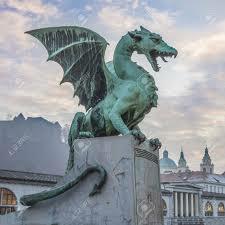 The dragon dominates the iconic Dragon Bridge and the popular tourist attraction Ljubljana Castle. 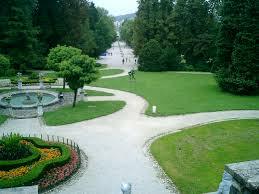 Ljubljana is a green city and has many lovely parks and a botanical garden. Its largest par is Tivoli right in the center. Tourists enjoy taking cruises on the Ljubljanica River. One of the places where residents of the city get together is at Ljubljana’s Central Market. Here is an open-air market that is located between two squares the Vodnikov and Pogacarnev Squares as well as a covered market and some small food shops that line the Ljubljanica River. These food shops are referred to as Plecnik’s Covered Market and are located in a colonnade that was designed by Ljubljana’s famous architect Joze Plecnik. The City Museum of Ljubljana is housed in the Auersperg Palace. This is a historic building that was once owned by the House of Auersperg, Dukes of Carniola. The palace dates back to 1642 and has undergone several restorations. There are pilasters at the front façade and a classical entrance portal. There is an interesting arched courtyard. Architects Spela Videcnik and Rok Oman made it into a modern museum. Here visitors can enjoy the Renaissance architectural features of this palatial museum building and take a stroll along a 1st century Roman road and even meet the Underwater Troll in the “Search for Yourself” exhibition room. The museum has the world’s oldest wooden wheel with an axel dating back to 3500 B.C. 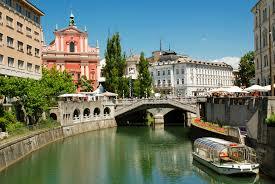 There is a permanent exhibition Faces of Ljubljana highlighting the life and history of Ljubljana. The museum also offers a special guided tour for children between the ages of four and seven which involves a sort of hide-and-seek game that is led by two friendly frogs, Ljuba and Ana. Of great interest is Emona: The Roman Trail of Ljubljana. This is a circular route displaying ten monuments of the Roman city of Emona. The trail includes the Emona House and the Early Christian Center, archaeological parks. Here visitors can see the well preserved remains of Roman houses in Ljubljana and the remains of the Emona city wall. All of the monuments are marked with information boards that have QR codes allowing smart phone users to access related audio and visual content on the Internet. Tickets for this are available from the City Museum of Ljubljana. The impressive Dragon Bridge is decorated with four famous dragon statues. This bridge is a wonderful example of Art Nouveau and was constructed between 1900 and 1901. This was the city’s first reinforced concrete structure and one of the largest bridges of its kind to be built in Europe. When the bridge first opened it was known as the Jubilee Bridge of Emperor Franz Joseph I. The first original designs showed that the bridge was supposed to have winged lions not dragons. 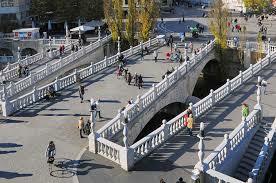 The Dragon Bridge got its Art Nouveau appearance from Dalmatian architect Jurij Zaninovic. There was once a small square located back in the Baroque period where the present Kongresni Square is located today. At the south end of the square is the University of Ljubljana. Nearby is the Slovenian Philharmonic Building and next to it a Bidermeyer Building that houses the oldest Slovenian publishing house. At the north end is the neoclassical Kazina Building. Stretching across the central part of the square is Zvezda Park which has several historic attractions. 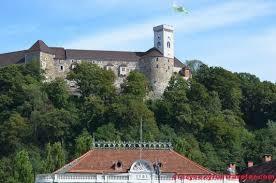 A most prominent site is Ljubljana Castle which offers some spectacular views of Ljubljana. Within the castle are several museum exhibitions and presentations like Slovenian History, The Prison and Virtual Castle among others. The castle is accessible by funicular railways and also has two restaurants, Gostilna na gradu and Strelec. Its viewing tower shows the city from a bird’s eye view. There is a virtual walk through the history of Ljubljana Castle showing the castle’s architectural development. This 12 minute virtual tour is available in English, German, Italian, Croatian, Russian, French and Spanish. Originally built in Gothic style St. George Chapel was later rebuilt in Baroque style. It is located in one of the oldest parts Ljubljana Castle. It’s decorated with 15th century frescoes and 1747 wall paintings of the coats of arms of provincial governors-general and five Austrian rulers. One of Ljubljana’s best known Baroque monuments is The Robba Fountain also known as The Fountain of the Three Carniolan Rivers. It stands at the edge of Mestni Square. 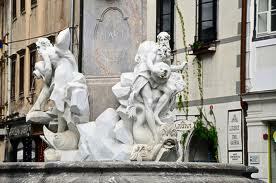 It was created between 1743 and 1751 by Venetian sculptor and architect Francesco Robba. The fountain was modeled after famous Roman fountains. The sculpture shows three river gods that represent three Carniolan Rivers – the Sava, the Ljubljanica and the Krka. The ground plan of the fountain is shaped so that it forms Ljubljana’s ancient three-leaf town seal. The city’s largest and most beautiful park is Tivoli Park located right in the center of the city. It was designed in 1813 by French engineer Jean Blanchard and joined together the parks which had originally surrounded Podturn and Cekin Mansions. Within the park are three grand Horse Chestnut Tree lined walks and its landscaped with ornamental flower beds. There are many statues and fountains. In the park is Roznik Hill that has several walking paths and a trim trail with some exercise stations along its length. The scenic Jakopic Promenade was designed by architect Joze Plecnik in the central part of the park and has an outdoor exhibition of large-format photographs that can be seen all year long. Tivoli Park also has a fish pond located near a small botanical garden with a glasshouse. Inside is a permanent exhibition of tropical and carnivorous plants. Across from this is a children’s playground. The central of the three bridges that form the Triple Bridge has stood in place since 1842. It replaced an important medieval wooden bridge. The side bridges which are intended for pedestrians were added to the original stone bridge and designed by architect Joze Plecnik. He added massive stone balustrades and lamps to all three bridges. From each of the side bridges there are two stairways that lead to terraces situated just above the river. Poplar trees were planted here to add to the beauty of the bridges.